1. From the association 'dashboard' click on the Settings icon and select Settings. 2. Under ‘Manage Competitions’ click on Fixture Templates. 3. Click on the Add button to add a new fixture template. 4. Enter the details of the fixture, ensuring that all compulsory fields (with a red star) are completed. Enter the name of the Fixture Template. Use a name that describes what type of fixture template you are creating. For example ‘5-6 Team Normal Fixture’. Enter the number of teams for the fixture template. For example ‘6’. 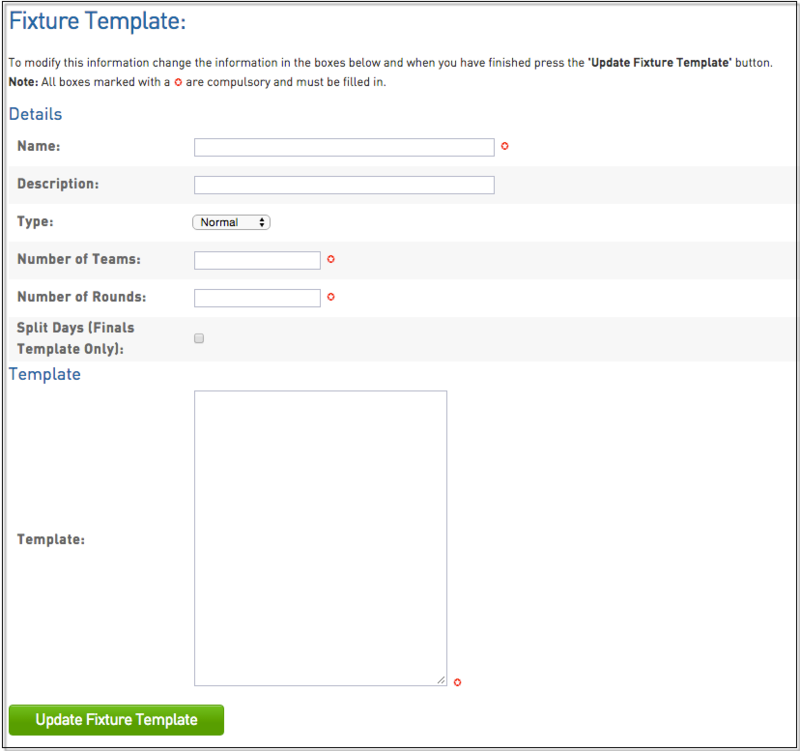 Note that the number entered provides the maximum team number that can be used within the template. Enter the number of rounds in the fixture. For example ‘5’. 4. On the following lines repeat the same game format, making sure that the rounds are in numerical order and that the first match number of a round follows on from the last match number of a previous round (first match in first round must be 1). Exactly like this ‘Round 2’ ‘3’ ‘4 2v3’ Continue this process until you have entered all the rounds and matches for your fixture. Click Update fixture template to save your changes. 2. The number of rounds in the fixture is equal to that entered in the details of the fixture template. 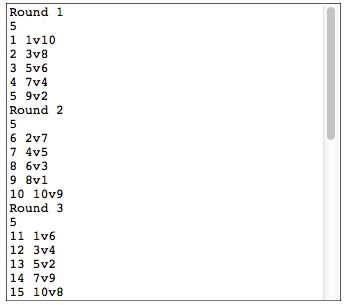 The rounds are entered in ascending numerical order. 3. The match numbers continue in ascending numerical order from round to round. For example if Round 1 has 3 matches then Round 2 begins with match number 4. Please note when you click ‘update 'fixture template’ if you have entered anything incorrectly a screen will appear saying that there are errors, which means you haven’t entered the fixture template properly. Please go back and check that you have followed these instructions. 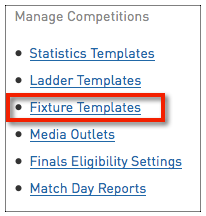 When you have successfully created your fixture template you will be ready to apply it to your competitions.